This could create a future of unhackable data. In a huge first for China and the world of quantum communication, researchers at the Quantum Experiments at Space Scale (QUESS) project have used a quantum satellite and quantum cryptography to transmit data to Earth from space. This data is potentially unhackable, thanks to quantum key distribution (QKD) technology. This was the first such transmission from the satellite, which was launched in August of 2016. Today, encryptions are based on traditional mathematics. For now, they are mostly safe from hacking, but quantum computing would be able to completely change encryption as we know it now. Therefore, China is hoping to use transform encryption using quantum cryptography, and QKD technology in particular. QKD uses photons to transmit data, allowing two users in different places to, together, produce a common string of random bits called a secret key. This kind of encryption is unhackable because there is no way to copy a photon in a precise enough way for hacking purposes, and measuring a photon would disturb it, clueing in the users about the disruption. This technology could have huge implications in cybersecurity. Businesses would be safer online, and e-commerce would be free of problems caused by hacking and identity theft. The tech would also make it far more difficult for governments to spy on private communications — something that global leaders and agencies around the world have a vested interest in. China’s breakthrough transmission traveled about 1,200 kilometers to Earth from space, making it up to 20 orders of magnitudes more efficient than an optical fiber of the same length would be. This transmission is also much further than the previously understood limits of several hundred kilometers. This advancement is part of China’s overall push to become a major presence in space by 2030, a plan that includes reaching Mars by 2020. 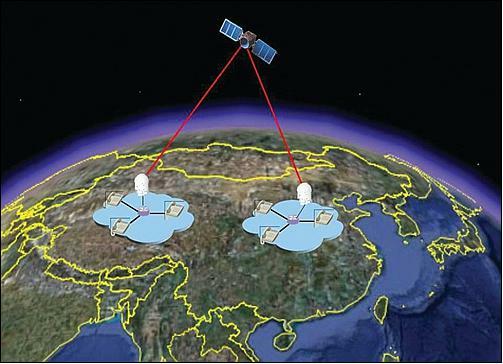 China envisions a future with ground-based QKD networks and a global satellite system interacting to form a powerful, worldwide secure network. This transmission is the first step toward making this vision a reality.